Cyber criminals nowadays thrive of illegal profits that they make from unsuspecting Internet users by using ransomware applications. One program of this category is known as Diamond Computer Encryption Ransomware. The scheme works in a relatively simple manner. Once such malicious program enters the computer, it encrypts a massive chunk of data sorted on it and then demands a ransom in return for decryption services. It is unfortunate that users without advanced computer knowledge easily fall prey to all of this. Our researchers have thoroughly analyzed the malware in question and in this report we provide comprehensive information regarding its devious inner workings. In addition to all of that, we also present virtual security advice that will help any user keep their operating system clean and secure at all times. Furthermore, our malware experts have crafted an easy-to-follow removal guide that you must use to delete Diamond Computer Encryption Ransomware once and for all if it is ever found active on your personal computer. 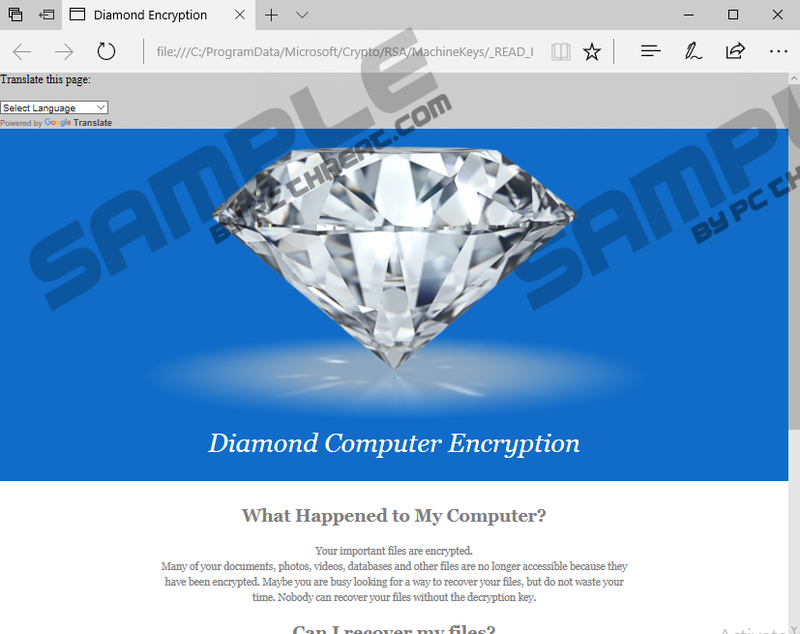 Diamond Computer Encryption Ransomware works quickly and aggressively. As soon as it gains full access to your operating system, it immediately starts the encryption procedure. This process is completely silent. Such functionality means that there is virtually no way of stopping this ransomware from locking your data. During the analysis, our researchers have discovered that it mainly targets picture, video, and document files. Just like many of its contemporary counterparts, this malware uses a robust algorithm to encrypt your data. Due to the strength of the cipher manual decryption is out of the equation. As soon as all the dirty work is done, you will notice a file on your Desktop entitled _READ_IT_FOR_RECOVER_FILES.html. That is a ransom note, which provides information about the fact that a lot of your files are no longer accessible. It also informs that you can decrypt your data only with a unique key, which, of course, is held by the cyber crooks. Not surprisingly, cyber criminals demand a payment of 0.1 Bitcoin, which is about $300, in return for your files. Under no circumstances abide by these requests as you could lose not only your data but a significant amount of money as well. That is so because malware developers are not bound legally to decrypt your files even if you make the Bitcoin transaction to the provided address. As you can see, having this malicious piece of software active on your PC can have disastrous outcomes. Be sure to execute a thorough removal of Diamond Computer Encryption Ransomware at the very same moment that it is found active on your PC. Taking action against programs such as Diamond Computer Encryption Ransomware is crucial especially nowadays as they are extremely prevalent. To sustain a clean and secure operating system at all times, you first need to start practicing safe browsing habits. We highly recommend avoiding all suspicious websites as they might present you with devious content such as ads, pop-ups, and coupons, which could host redirect links. Unfortunately clicking on such content might lead you to malicious sites designed by cyber crooks in such a way that just entering them could be enough to infect your personal computer. Likewise, we advise you to bypass all unauthorized third-party download web pages because they are notorious for being the primary source of bundled installers, which often suspicious and potentially dangerous programs. Another prevalent method of distribution used by cyber crooks nowadays is spam email campaigns; therefore, it is imperative to stay away from any attachment that comes your way from am an unknown source. Lastly, but most importantly, be sure to obtain and install a licensed antimalware tool if you do not have one already. Such a tool is critical to your overall virtual security since it can detect and delete any harmful application automatically. It should be more than obvious why the removal of Diamond Computer Encryption Ransomware must be executed without any delay. Be sure to pay your utmost attention to every single step of the removal guide that we present below. Keep in mind that a single mistake could lead to an incomplete removal, meaning that leftovers linked to Diamond Computer Encryption Ransomware might remain active on your PC. This is a situation that you do not want to find yourself in since traces of this malware could be capable of restoring it without your knowledge. To be sure that the termination procedure has been successful we encourage you to double-check your operating system for anything associated with Diamond Computer Encryption Ransomware as soon as you are done with the manual removal instructions. Another way to be sure that no devious traces are active on your PC is scanning your computer with a professional antimalware tool because it can identify and remove any suspicious or malicious content from your PC automatically. Select a malicious .exe file and tap Delete on your keyboard. Remember that the name of this file is usually randomized. Quick & tested solution for Diamond Computer Encryption Ransomware removal.